Google is the Internet’s most popular search engine (the software program that helps you find websites you’re looking for). The company also makes many other software products such as Google Maps and Google Chrome. Google also owns many Internet companies including YouTube and Blogger. Google, the company, has a reputation for being innovative, hip and most of all, fun. The people who work there have to come up with a lot of creative ideas. In order to help spark all that creativity, Google has put a lot of fun elements in its Toronto office. 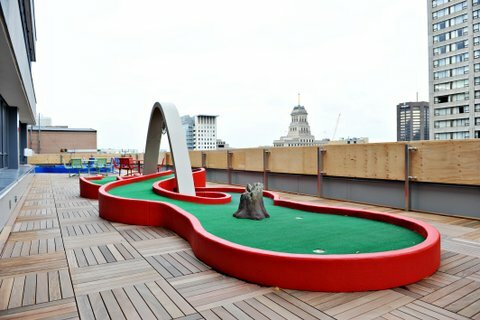 For instance, there’s a five-hole mini-put golf course on an open patio area. Each of the holes is inspired by a different location in Toronto, such as Toronto Island. Googlers (as the employees are called) can even barbeque on the patios in the summer. The employees get a healthy breakfast and lunch prepared for them every day. Google’s chef uses fresh, local ingredients. The floors throughout the building are made of shock-absorbing cork, which is easier to walk on and relieves stress on people’s knees and ankles. On Hallowe’en, an artist named Byron Remple turned Googlers into zombies using make-up. Conference rooms at Google are special, too. One of them is designed to look like a room in a rustic house, with a fireplace and stained glass windows; many of the walls are actually whiteboards, so ideas can be written right on them without the need for a flipchart. A library includes a secret room where Googlers can hide out and think in peace. The office even has a soundproof music room, where Googlers can create and record music or learn a new instrument. There are also plenty of games at Google’s office, including ping pong, arcade games and darts. What else? How about: a billiards room, massage room, camping lounge, fitness room, DJ room and micro kitchens on every floor? Google’s Canadian headquarters are at 111 Richmond St. West, in downtown Toronto. Why do you think Google went to all the expense and trouble of making their headquarters so fun? Why do you think every company doesn’t do that? Today’s article contains many images. How is your understanding of today’s article improved by looking at the photographs? Which photograph is the best at helping you understand what working at Google would be like? Identify a variety of text features and explain how they help readers understand texts (OME, Reading: 2.3). Identify a variety of text features and explain how they help communicate meaning (OME, Reading: 2.3). The internet is an invention that has changed the world in many ways. It has also changed the language we use. Internet sites like YouTube, Tumblr, Instagram, Facebook, Twitter, and Blogger have introduced new words to the English language. What would you name the following internet sites.